As a former quilt guild Historian, I am an advocate for photographing your quilts and quiltmaking to document your quilting journey, inspiration, materials used, process, progress, quilt finishes, quilt giving and display opportunities. 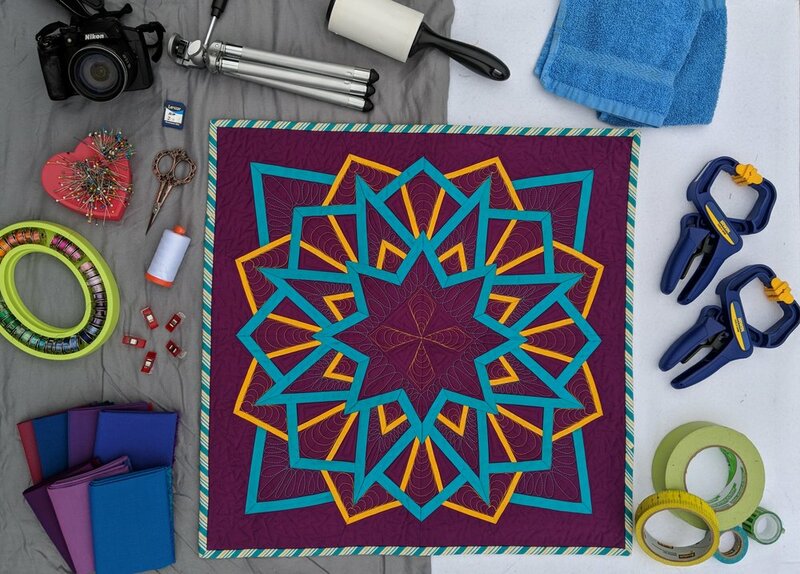 Read on for more tips and tricks on capturing great pictures of your quilting adventures! Learn to use what equipment you already own (most of my pictures are taken with my Pixel smartphone). Position yourself directly in front of/above your project so you can get square shots (vs. trapezoid/keystone effect). Use the grid option on your camera to help you align straight edges. Photograph in good light. Rather than invest in expensive lighting fixtures, photograph outdoors using natural light, especially during the golden hour or on an overcast day, which offers optimal lighting conditions. Try to avoid direct bright light which makes it difficult to photograph as it can cast shadows onto your quilt. When in doubt, take lots of pictures! Experiment with different angles, layouts, lighting, times and locations to see what works best for you. Learn editing software to crop, straighten, add contrast, color correct, skew/stretch to be square and create mosaics.